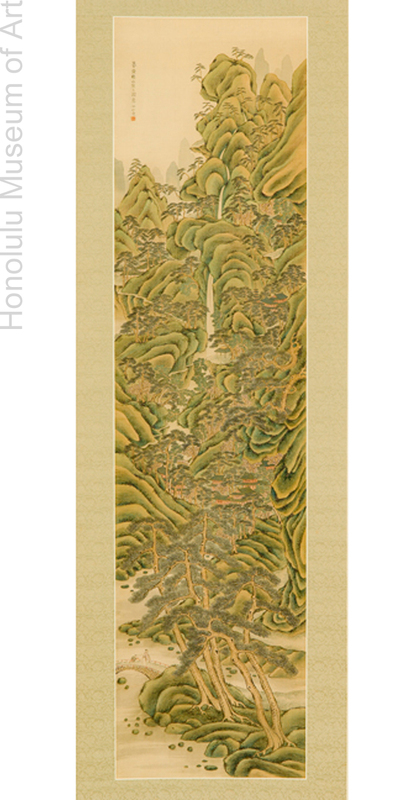 Tanomura Chokunyū’s Landscape in the Style of Wang Meng is an energetic portrayal of a mountainous vista. Chokunyū uses densely layered texture strokes to produce undulating ridges that sweep inwards and upwards, overlapping and compressing the pictorial space. A waterfall in the midst of this restless intensity brings structure to the image, giving the painting a central axis. An abundance of pine trees permeates the landscape, punctuating the space between the rocky ridges. The painting features an abundance of green in varying tonalities, giving the environment a warm, wet feel. Chokunyū’s paintings frequently feature a synthesis of attributes taken from literati paintings of the Ming (1368–1644) and Qing (1644–1911) dynasties. In the case of this painting, he remains faithful to the form and spirit of works by Wang Meng (1308– 1385), one of the four great landscape painters of the Yuan dynasty (1279–1368) known for employing a rich variety of texture strokes made up of twisting, writhing lines. Wang Meng’s landscapes pulse with an energy barely contained by their traditional painting structure, an aspect aptly captured in this work by Chokunyū. Tanomura Chokunyū is commonly acknowledged by scholars of Japanese literati painting as one of its most skilled practitioners, as well as one of his generation’s most erudite scholars of Chinese painting and poetry. A child prodigy, Chokunyū originally modeled his style after that of Tanomura Chikuden (1777–1835), who adopted him when Chokunyū was eight. After Chikuden’s death, Chokunyū focused on Chinese paintings, after which his painting style evolved considerably. Generally speaking, however, his works can be characterized by his preferences for strong color, minute brushwork, and complex compositions.